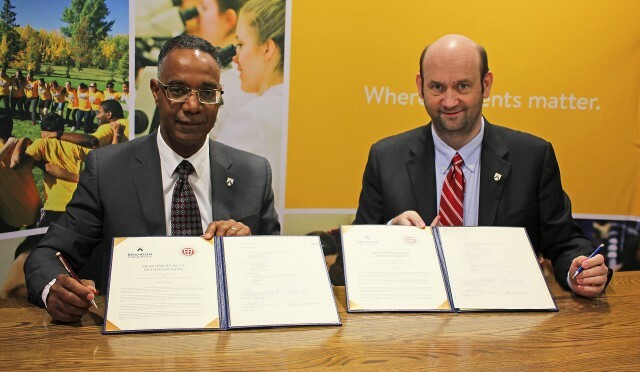 Brandon University President, Dr. Gervan Fearon, and Dr. P. Benjamin Robinson, Assistant Director of Admission – Canada, for St. George's University, pose with the signed MOU. BRANDON, MB. — Students will have new options to get a degree in medicine or veterinary medicine, thanks to a new agreement between Brandon University (BU) and Saint George’s University. The two institutions today signed a Memorandum of Understanding that will allow students to obtain medical or veterinary degrees at Saint George’s, in Grenada, after taking either a three- or four-year pre-professional science degree at BU. Manitoba’s Labour Market Forecast predicts that there will be 1,300 job openings for physicians, dentists and veterinarians by 2021. After two years at Saint George’s, medical students will take another two years in clinical rotation at affiliated hospitals in the Canada, the United States or the United Kingdom. Students of veterinary medicine will take three years at Saint George’s, followed by a year of clinical rotation at affiliated veterinary schools in Canada, the United States, United Kingdom, Australia, or Ireland. This new agreement builds on existing agreements that BU has for students to obtain a medical degree at the University of Manitoba, or a veterinary medicine degree at the University of Saskatchewan.